Initially, SERVER2 was named as SERVER, i thought this might have been the problem, so i rename the server using sproc sp_addserver and sp_dropserver. However, it did not do the trick. Then i noticed that under regedit Computer\HKEY_LOCAL_MACHINE\SOFTWARE\Microsoft\Microsoft SQL Server\120\machines, name was still SERVER so changed it from there to SERVER2 and restarted the machine. Tried running the job manually again it still gave me the same error. Turned off the firewall of SERVER1 completely, issue still persists. Also, under the shared folder on SERVER2, db backup file is not generated. I am wondering now what is this SERVER exactly here in log referring to. Any help or suggestions would be appreciated!! Browse other questions tagged sql-server sql-server-2014 or ask your own question. How to fix an odd LSBackup job error in Log Shipping? 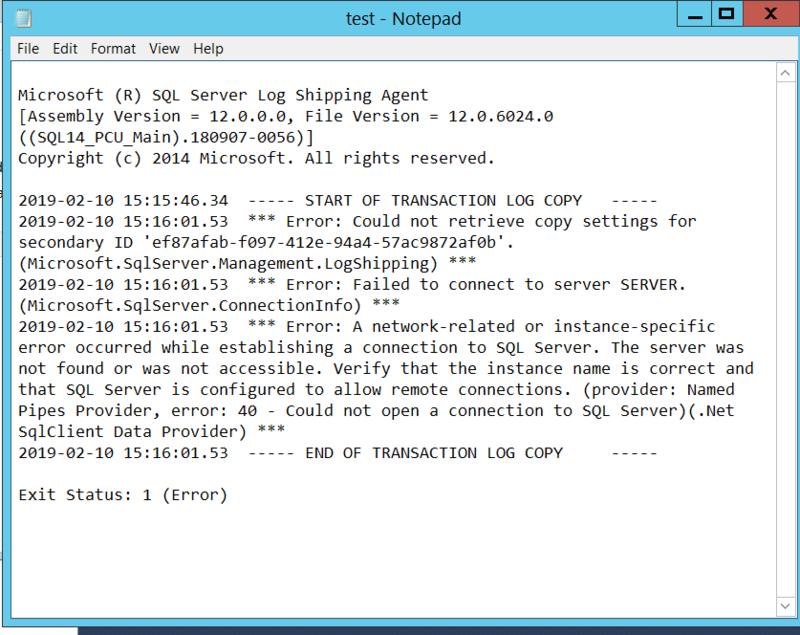 Does MSSQL Log shipping truncate the transaction log?